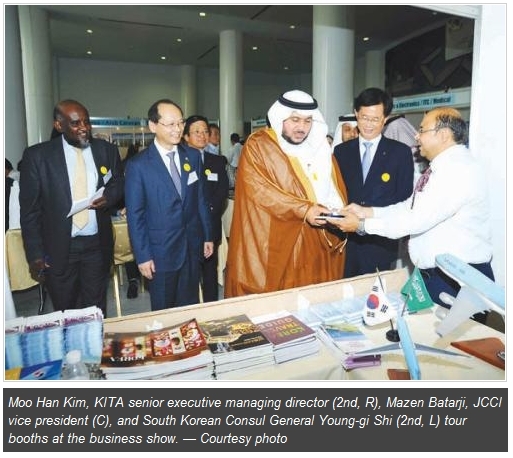 JEDDAH — A two-day Korean Business Show took place at the Jeddah Chamber of Commerce and Industry (JCCI) on October 1 and 2 to promote interaction between Saudi Arabia in general and the Western Region in particular with South Korea. Participating companies came to explore more effective and suitable means of cooperation especially by the private sector in both countries. During this year’s show, participating companies increased from 90 to more than 100 across various fields such as construction and engineering, industrial materials, electronics, IT, pharmaceuticals and healthcare, cosmetics, metal and automobile parts, household and consumer goods, renewable energy and recycling. The business show also hosted one-on-one business meetings with 15 visiting Korean companies, a seminar program on investment opportunities presented by Korean companies and Saudi sides to share views on upgrading their cooperation. Korea international Trade Association (KITA) signed a Memorandum of Understanding on prompting cooperation with JCCI to facilitate business interaction between the two countries. Speaking at the event, South Korean Consul General Yong-gi Shin revealed that this year’s event gains particular momentum with the visit of the Korean-Arab Caravan Trade Mission organized by KITA, the largest business association in Korea. “Since the establishment of diplomatic relations in 1962, Saudi Arabia and Korea have developed very close friendship and cooperation in various fields particularly in economic activities which have proven to be mutually-beneficial,” said Yong-gi Shin. “Korea imports one third of its oil consumption from the Kingdom. Many Korean companies are engaged in execution of various important projects such as power generation, desalination and petrochemical plants. In 2012, the total trade volume between the two countries reached $48 billion marking Saudi Arabia the 4th largest trade partner of Korea. The imported petrochemical products from Kingdom to Korea were valued $39 billion and exported industrial and consumable goods valued at $9.1 billion,” Yong-gi Shin continued. Adnan Mandourah, Secretary-General of JCCI said the two countries have cooperated in different fields. Moo Han Kim, Senior Executive Managing Director at KITA said Saudi Arabia’s recent efforts in industrial diversification have allowed the group to extend beyond its traditional trade partners and build cooperation in promising new industries such as machines, auto parts and urban infrastructure. “With Saudi Arabia’s abundant resources and financial foundation and Korea’s cutting-edge technology and skilled labor, there is no doubt we can achieve a high level of synergy,” Moo Han Kim said. Consul-General Yong-gi Shi held a dinner reception on the sidelines of the business show where participating Korean companies’ representatives had an extra opportunity to meet with specialized Saudi professors and prominent figures and discuss business related issues. Bakr Khoshaim, a mechanical engineer and businessman, said Korean products have a good reputation in the Saudi market which is open to all products. KITA trade mission participating companies are Actiontech Co., Cheil Coating Exso Co., Flowtech Co., Jung Woo Textile Co., Korea Future Parts, Korean Hydraulic Machinery Co., MCP Co. Ltd., Osung KFT, Sechang Corporation, Sinwoo Tech Co and Soosan Heavy Industries Co. in addition to three more Korean companies and JCCI members and other interested companies.